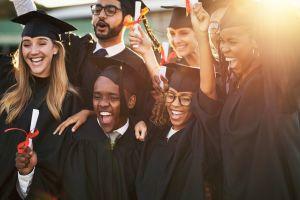 42% of the top 50 universities in the world now offer at least one course on a cryptocurrency or blockchain technology related subject, according to a new report from Coinbase, the popular US-based fiat-to-crypto exchange. 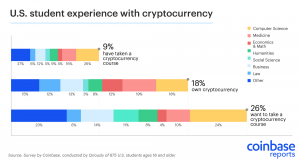 The report said that students from a range of majors have an interest in crypto and blockchain courses, and that such courses are being added across a variety of university departments. David Yermack, chair of the finance department at NYU Stern School of Business, said in the report that when they first opened a blockchain course in 2014, only 35 students signed up. By the spring of 2018, however, that number had risen to 230 students and the class had to be moved to the school’s largest auditorium. Another professor cited in the report, Campbell Harvey of Duke University, explained that his law students are normally facing a tough job market once they graduate. For law students trained in blockchain, however, it’s a different story. “They don’t need to apply anywhere. People are just asking them to join their firms,” professor Harvey said. 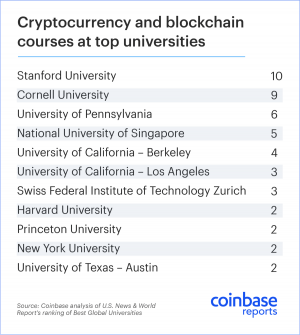 In a ranking compiled by Coinbase, Stanford University topped the list with 10 courses on cryptocurrency and blockchain. The majority of universities ranked were US-based institutions, with some notable exceptions including the Swiss Federal Institute of Technology in Zurich and the National University of Singapore. The research report was made in collaboration with survey company Qriously by interviewing 675 American university students and reviewing 50 universities from outside the US. 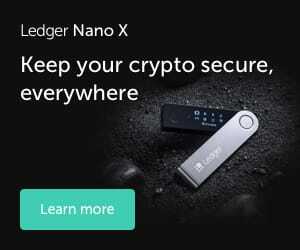 The report further revealed that non-US universities still have a way to go, with only five of the 18 international universities on the list offering at least one course on blockchain or cryptocurrency. Coinbase CEO: "It’s Getting Harder to Find Crypto Skeptics"